I have another super simple yet pretty Make and Take card to share with you. 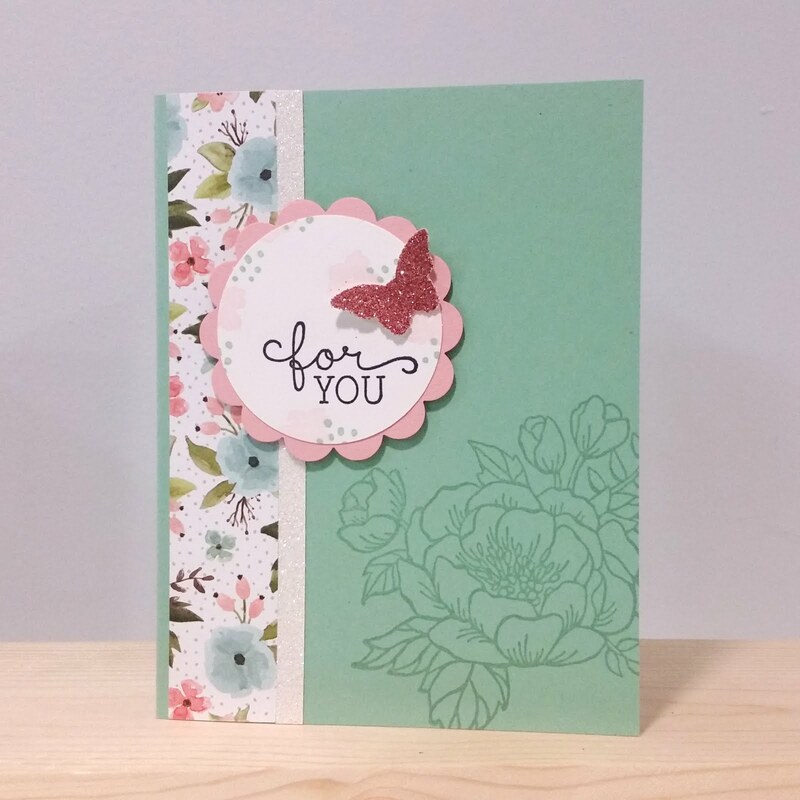 This one features the Birthday Blooms stamp set and coordinating Birthday Bouquet designer series paper. This card really packs in the sparkle too! This Make & Take card was inspired by this project made by Julie. Mint Macaroon Cardstock 5-1/2" x 8-1/2", scored at 4-1/4"
Birthday Bouquet DSP 1" x 5-1/2"
I started off by folding the Mint Macaroon cardstock on the score line. Then I stamped the large flower image from Birthday Blooms in the lower right hand corner of the card front in Mint Macaroon ink. The strip of DSP was adhered to the left edge of the card front with glue stick. The strip of Dazzling Diamonds glimmer paper was adhered right next to the DSP with 2-Way Glue Pen. 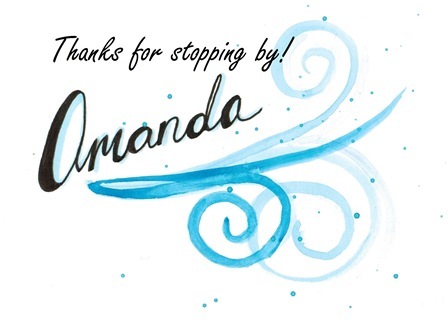 The greeting was stamped onto a scrap of Whisper White cardstock in Jet Black Stazon ink. The greeting was then punched out with the 2" Circle punch. 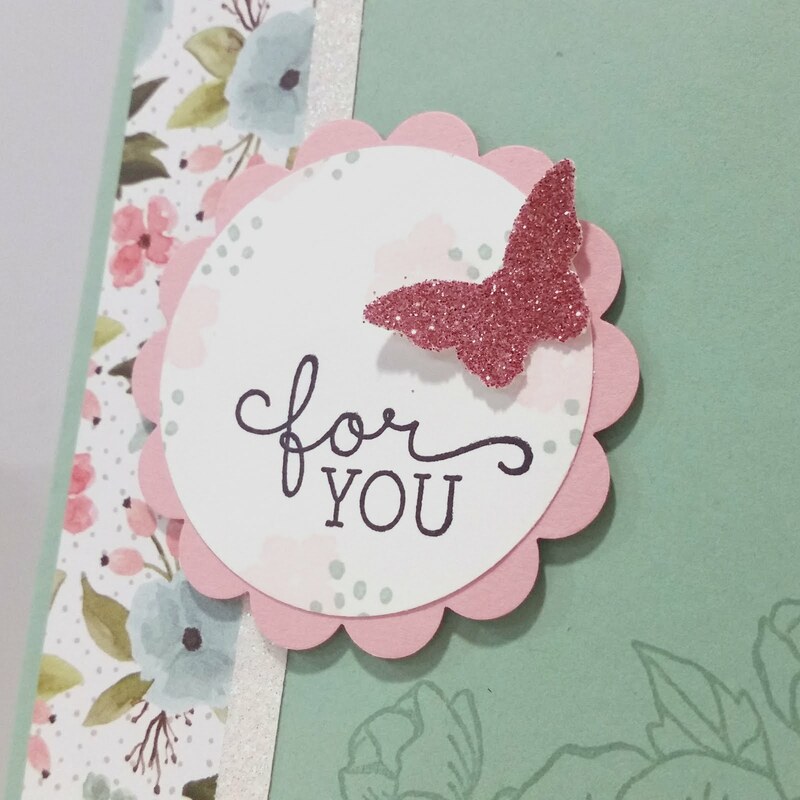 The small flowers were stamped around the greeting in Pink Pirouette ink. The small dots were stamped around the greeting in Mint Macaroon ink. The 2-3/8" Scalloped Circle punch was used on a scrap of Blushing Bride cardstock. The greeting circle was adhered onto the Blushing Bride scalloped circle with glue stick. The layered circle was stuck onto the card front with a few Stampin' Dimensionals. To amp up the sparkle the Bitty Butterfly punch was used on a piece of Blushing Bride Glimmer Paper. The butterfly was adhered next to the greeting with a glue dot. And that's another Make and Take project done!